I love experimenting with new face washes every now and then! 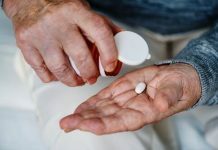 I recently got a chance to try out some beauty products from a pharmaceutical brand called Mentholatum Acnes. This Fairness Wash is one of the products that I have been trying out from them. Scroll down below to know about my opinions on it! A pearl appearance face wash with fairness and acne-fighting ingredients to deliver natural whiteness and clear skin. Skin-Lightening Complex: Enriched with unique combination of fairness ingredients like Yogurt and Lactic Acid to deliver skin-whitening and sustain the skin glow. Clarifies acne: IMP* helps to remove 99.9%** acne-causing germs, prevents future breakouts and delivers skin clarity. Smoothens Skin: Natural fruit extracts actively treat and help prevent breakouts, diminishes redness and visibly reduces acne-scar. 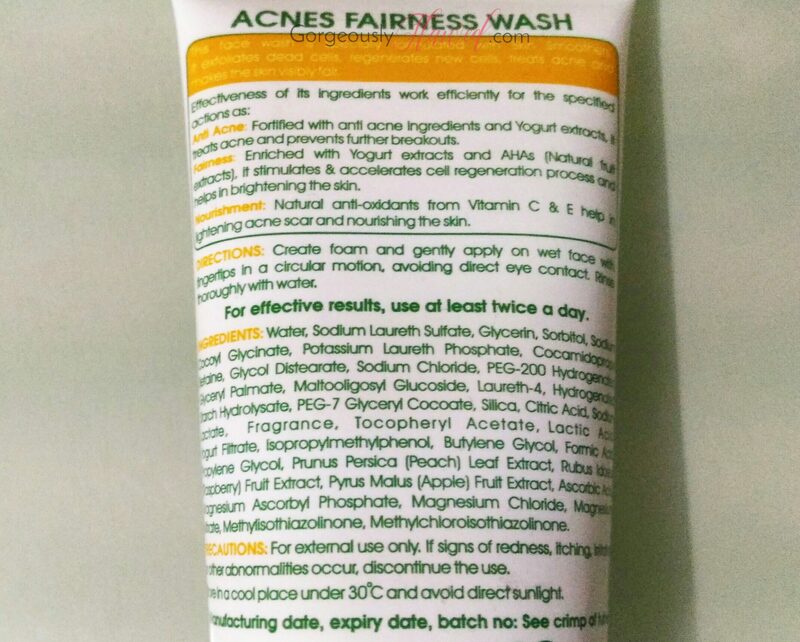 Acnes Fairness Wash comes with benefits of yogurt and various fruit extracts like peaches, apples, raspberry, etc. It is a semi opaque, gel-like face wash which easily lathers on a damp skin. Its lather is somewhat creamy and not bubbly despite of SLS being one of its main ingredients. Speaking of its smell, it smells nothing short of divine! I absolutely love its fruity aroma. The face wash claims to whiten your skin with the help of yogurt and lactic acid while combating acne causing germs with an antibacterial ingredient called Isopropylmethylphenol. I am using the Acnes Fairness Wash from about 20 days along with the Acnes Sealing Jell (which I will be reviewing soon). To use it, I firstly dampen my palms and face. After that, I gently massage the product on my face – concentrating on the areas where I have acne or spots. I like to massage it on the problematic areas for good 1-2 minutes to get better results. The face wash easily gets rinsed off with water and leaves the skin squeaky clean. I felt that it does dry out the skin a bit, we can blame SLS for that. I have come to a conclusion that it will only suit on people with oily skin. My skin is mostly oily, but due to cold weather, I’m getting a few dry patches on my face and this face wash dries them out even more. 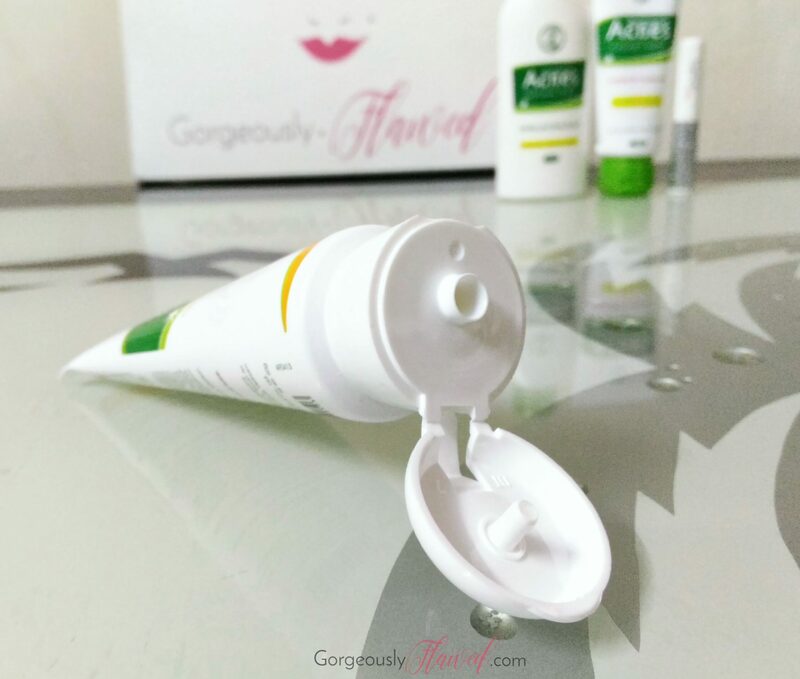 I’d love to use it during summer time because it effectively removes oilyness from skin! I can’t say whether it alone works on breakouts because I am using it with their sealing jell, but I have noticed the reduction in size of the pimples/whiteheads on my face. I will use it a few more times and let you all know if it actually works on the acne! Has a nice fruity smell. Sort of works on pimples. Contains SLS (Sodium Laureth Sulfate) as one of the prime ingredients. Dries out the skin a bit. 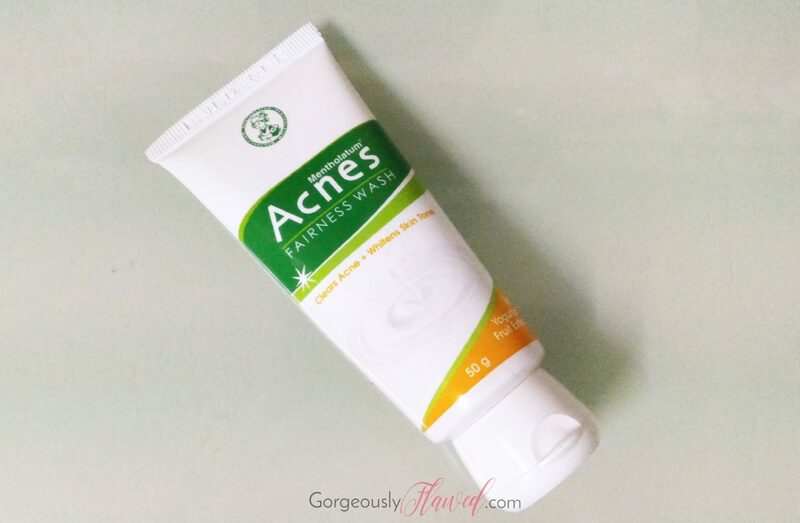 I’d recommend this Acnes Fairness Wash to people with oily and acne prone skin. The only downside of this face wash is that it contains SLS so try it only if you don’t have any problem with this ingredient! 🙂 The other face wash by Acnes which I have used doesn’t contain SLS or parabens, check out its review here. I think I will skip this face wash as SLS irritates my skin, though it seems to have many impressive ingredients like yoghurt and fruit extracts.